In today’s time, offices find managing employee attendance becoming a challenging task. Many organizations find a great deal of time getting wasted in verifying & processing biometric data. Implementing automated Time & attendance management software increase efficiency, frees up precious administration time and helps minimize the errors with manual data entry. TimeCheck software has robust features to meet specific demands of each company and simplify Time & Attendance process. It adapts to any organization’s leave policy & helps managers to get any customised reports. By investing upfront in this automated attendance system HR can prevent time theft, buddy punching and reduce administrative costs. The cutting edge attendance management system automates employee time sheets and empowers HR view graphical reports in real time, including databases collected from remote locations. 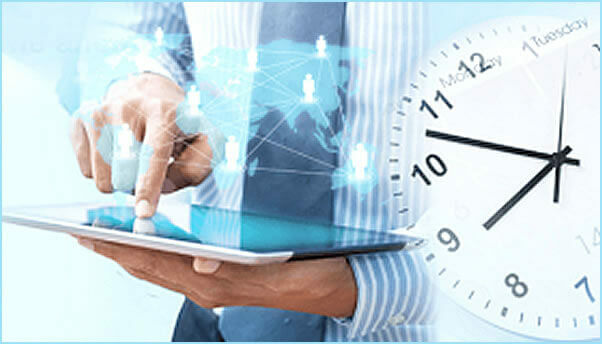 TimeCheck is designed in a user friendly manner to integrate with any hardware device and easily handle even complex attendance logics and entirely remove the stress involved in daily monitoring employee Late in / early out, shift pattern scheduling, overtime handling, on duty tracking, Flexi time management etc. Timecheck Software would be an ideal solution for any organization that looks to robust system that does all for you. It ensures on-time payment of salaries, when integrated with your existing payroll software (HRMS, SAP, Payroll, Tally, Oracle). We work with you, collaboratively. A pioneering India-based Internet-solutions company with offices worldwide. Our unique Full Service Provider (FSP) solutions model brings you the best of the worlds of Offshore Software Development, E-Business Products and Interactive Media. Coimbatore - 641 045, India. Copyright © 2019 TimeCheck. All Rights Reserved.